Looking for the Roleplaying System that lets you get it "right"? - Incorporate any of the many available optional rules, techniques, and add-ons (including magic systems and the like) - or create your own! 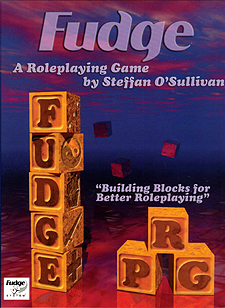 This book incudes the complete Fudge roleplaying game system, plus an extensive collection of "Fudge Toppings" - additional "Crunchy Bits and gamemastering advice for use with the Fudge system. Fudge is recommended for experienced Game Masters (some decisions will be needed to customize Fudge to any given genre, campaign world, and gaming style), although the Fudge game system is easy enough for first-time roleplayers and flexible enough for experienced gamers.